Good day of climbing. We were up on the Thaiwand Wall & Cave. We both climbed well today as we are warming up to the style of climbing here. Did a climb called "Monkey Love" and we both loved it. On our hike back through the jungle we ran into some unusual monkeys with black faces and white rings around their eyes. They are called Spectacled Monkeys. After some beach and swimming time we "suffered" through a long Thai massage before dinner. Then we finished off daylight with one last climb at the One,Two,Three Wall near our place. Enjoyable. Hot tropical day. Took a morning off of climbing and went on a diving trip. The dive shop took us to the Koh Phi Phi Islands for a couple of dives and lunch. We spent a total of 5 hours on the dive boat traveling there and back. Sunny and beautiful day. Got sunburned of course. The first dive was excellent. Probably the best dive site of all my trips to Thailand. Deb stayed up top snorkeling around. We shared the trip with a nice couple from Denmark. I asked them many questions about Denmark and their life there. We got back to Railey in time for Deb and I to wade out to Happy Island and climb my favorite climb in this area. "Don't Worry Be Happy". The tide has to be low and it just happens that low tide was just before dark. We had to use our head lamps to get back across the narrow neck of water and onto Phranang Beach. Beautiful evening. Today we got up early and after a quick breakfast we ventured out climbing. The tide was at it's low point therefore we went to some climbs that we could only access when the tide is out. I was spent after a couple of hours. Good climbs. The forecast was for thunderstorms but the morning was sunny and hot. We spent several hours on the beach and even rented a kayak to paddle around Happy Island. I grabbed my snorkel and took it with us on the kayak. Yes there were fish and some coral. Nothing great, but I did encounter something I have never seen before. Lots of jelly fish and what I believe were chains of jelly fish eggs. Mostly crystal clear and if you grabbed hold then it would separate and release each individual cell. As I swam around I was covered in them. It felt weird on my skin and occasionally I would get a sting from the jelly fish. It was like swimming through a gauntlet of jellies with stings on my body every few minutes. Nothing too painful or serious but enough to get my attention, especially on my face. Deb would have nothing to do with "surfing the jellies"! Just as I was getting ready for an evening session of climbing a thunderstorm came upon us. I thought we would get a few sprinkles and then it would pass. Oh no. Four straights hours of tropical downpours. Got soaked walking back to our room. And oh yeah. Deb is sick and I am starting to feel bad too. Got some bad water or food. Probably bad water. We haven't been very careful. Hope the medicine I brought will be helpful. My wound on my finger is healing slow, but at least it isn't infected and I can climb some on it. We arrived to the Phuket airport at midnight after the usual long flights across the Pacific Ocean. Our flights went well but sitting on an airplane for 20 plus hours is always hard on the body. We still had a two hour taxi ride through the countryside of Thailand to get to the small town where we catch the long-tail boat out to Railay. We stayed at a cheap but nice hotel we discovered several trips ago that is walking distance from the pier. When we arrived there at 3 am we had to wake the night desk guy who was asleep on a couch in the lobby. The clean bed and cool shower was so needed and we quickly fell asleep. The boat ride over was on rough seas as there was a lot of wind today but the familiar sight of Railay Beach was long awaited. After checking in at the Bhu Nga Thani Resort we hit the beach and swam in the warm waters. In no time I was working on a sunburn. It is obvious that the area continues to become more popular as we noticed several upgrades and changes and additions throughout the hotel area. Many Europeans and Russians. More than ever. About the same number of climbers, just more general tourists. Bummer. While swimming by some rocks I gashed my middle finger on a sharp rock. Looking at my bleeding wound I could see a cut that I would put three stitches into if I was seeing myself in the ER. Not a good way to start a climbing trip! Eventually I got Deb off the beach and into her climbing harness. We climbed at the 123 Wall near our hotel. 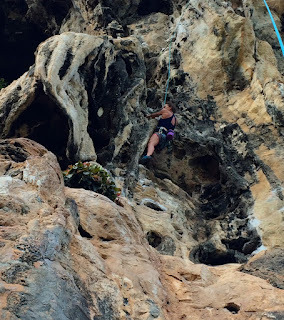 Fun climbing on stalactites and tufas right on the beach. I clearly will have trouble this week with a cut on the pad of my middle finger. I bandaged and taped it up tight. Somehow I will make it work. Dinner tonight was delicious. It cost us 250 baht. A little less than ten dollars. 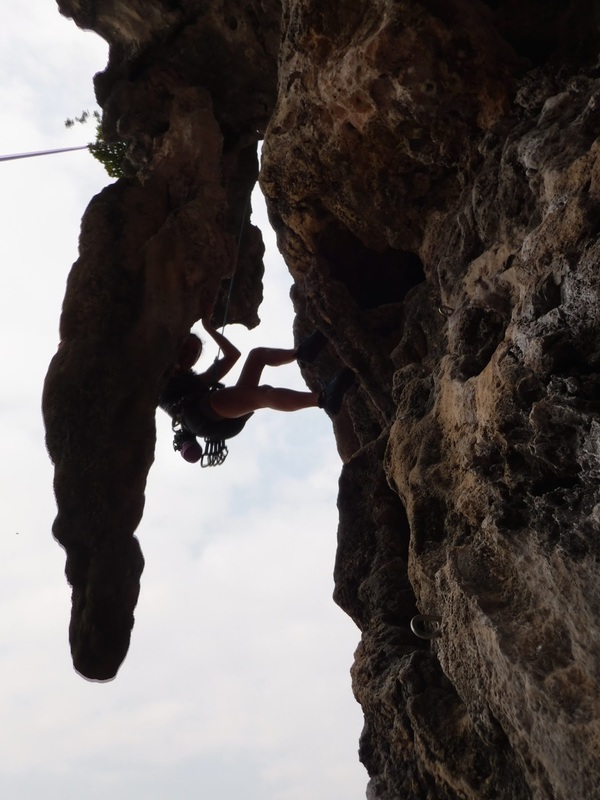 This is Deb using a stalactite to get up a climb today. The new year came with lots of snow storms in the mountains and cold temperatures. This has made for an extra good year for snow boarding and ice climbing. Apparently the El Nino is particularly strong this year according to weather experts. 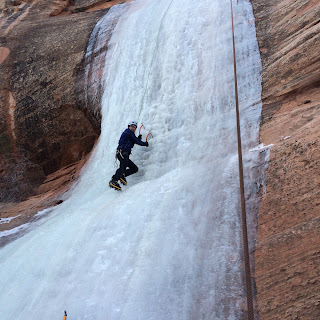 It is always tempting to stay down in the relatively warm desert and rock climb, but after a couple of pitiful years up in the mountains I have been taking advantage of this years winter weather. I have felt very comfortable climbing on the ice this year. Don't know if it is because I am finally getting some experience climbing ice or if it is something else. Angie joined me one morning a Camp Creek Falls. Snowboarding in the powder has been fun and I have enjoyed spending the time with my sons Marty & Eric. I did take a rag-doll tumble down Devos Pitch at Brian Head once. That hurt for a few days! Deb has stayed away from the cold and snow. I think she doesn't want to risk any injuries before we travel to Thailand for yet another vacation in the tropics. Another year and another Christmas Holiday! All of my children and grandchildren were with us this year. Lots of babies and little kids running around. Loads of fun! Marty & I had to work the day shift through Christmas but we were still able to enjoy family time before and after working. Classic St. George Christmas weather. A few mild storms with mostly sunny afternoons to get out mountain biking or climbing. My boys and I got in several good days of snowboarding at Brian Head. 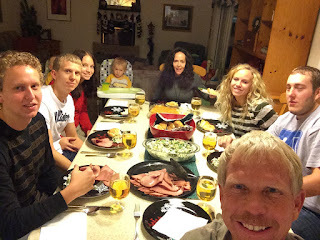 My parents came down for several days and we had a Larsen party one evening. Not all of the Larsens made it, but that was probably a good thing as our home can handle only so many bodies. As a family we have many blessings but this year did bring some challenges to each member of the family. Hope that the coming year will bring prosperity and good things for all.